This week I was trying to come up for air following the Thanksgiving holiday. As we went away, I came home to an empty refrigerator and no food. The bright side was my family got freshly cooked food every day. Who doesn’t love fresh food over leftovers? In general, I try to create meals that include a protein, a carbohydrate, a salad, cooked vegetables and fruit, if desired. Several times this week, however, I realized that we were low on prepared vegetables. In these situations, I always try to have frozen vegetables as a back up. Here is my fast and easy way to serve frozen peas. Put peas in pan and add the other ingredients. Voilà, fast and easy elegant peas. I am a time challenged cook. But, adding wine, fresh garlic and mustard gives humble frozen peas an elegant touch. 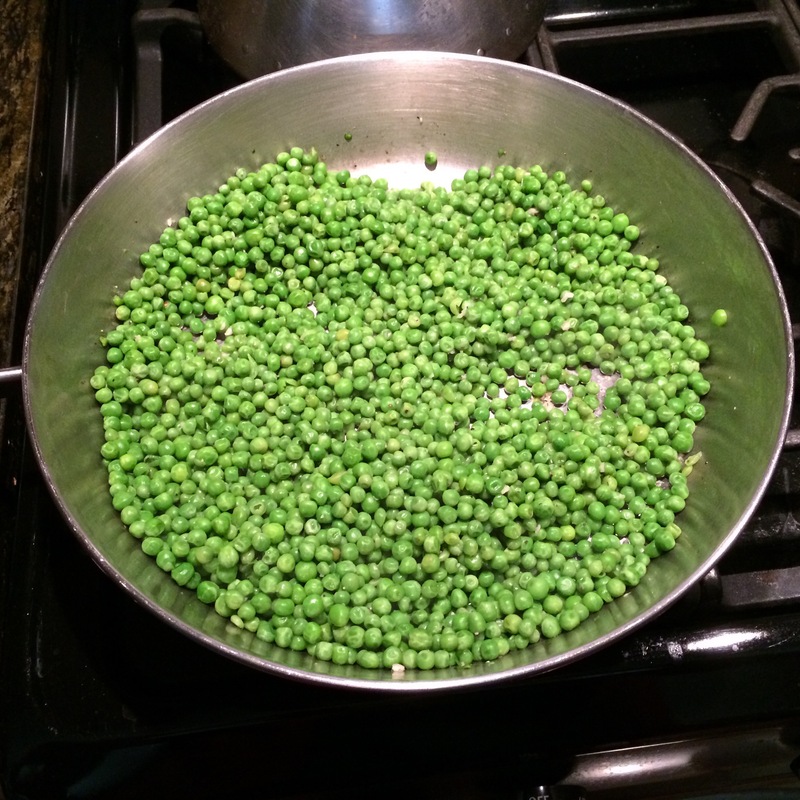 My husband loves peas but I get tired of just plain peas all the time. This will be a welcome upgrade and I’m sure he’ll love them made this way! Thanks for the recipe! Enjoy! It’s funny, but just adding a few ingredients upgrades the humble peas to a more gourmet level. Thank you for reading. Please share what spices you used! My husband loves South-Asian food. My mother made it very simple. She would add crushed red chilli flakes to give it some kick and fry a bit of cumin before adding the peas. There is a spice mix called “chaat masala” (found in all Indian grocery stores) You can add that as well according to your taste. Mustard is an interesting idea. I use frozen peas all the time. This would make them more interesting. Thanks for the idea. Thank you. Shelling peas is also time consuming and I rarely see them sold in the pods now.